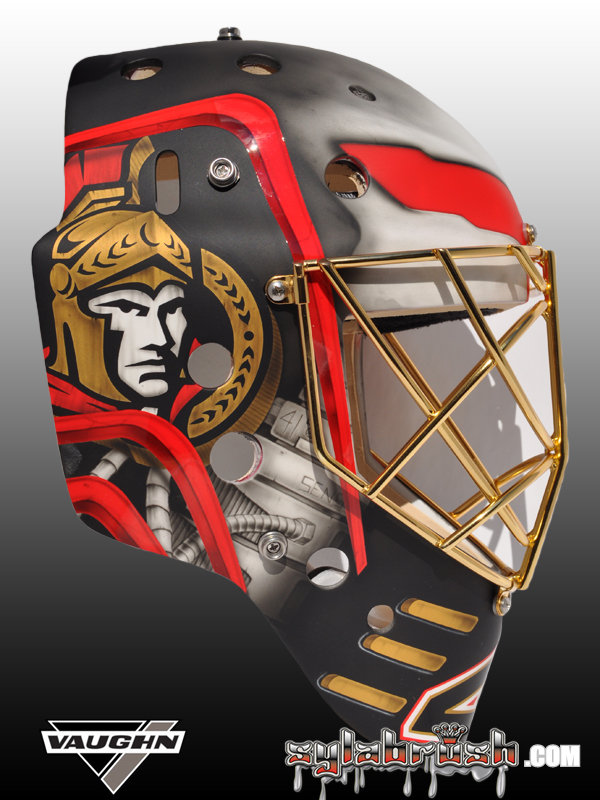 The very-talented Sylabrush has done my mask the last two years now. 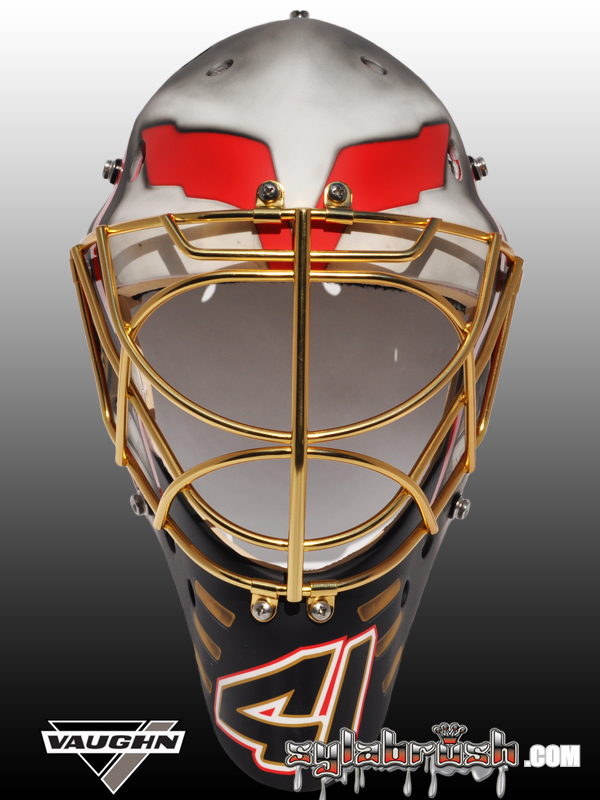 After initial sketch and a couple phone calls later we had several sketches to choose from. My biggest decision was choosing 3d vs 2d graphics as well as the color of the cage. 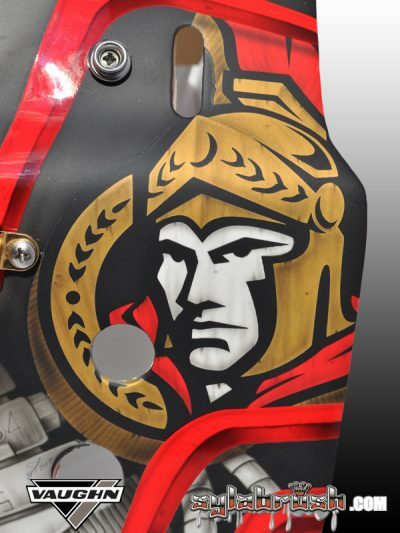 The artist really nailed it and have gotten great response from teammates and staff in the room. I really wanted to go with a new foundation this season – a matte black base coat did the trick well. 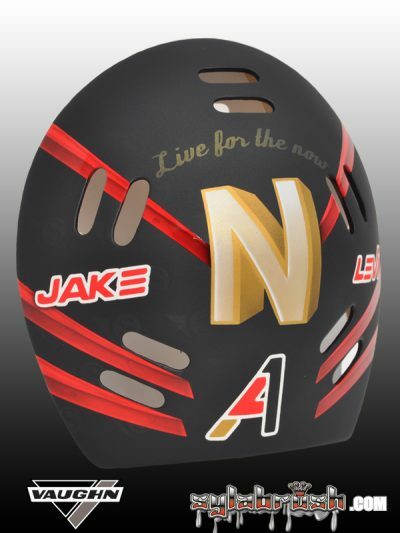 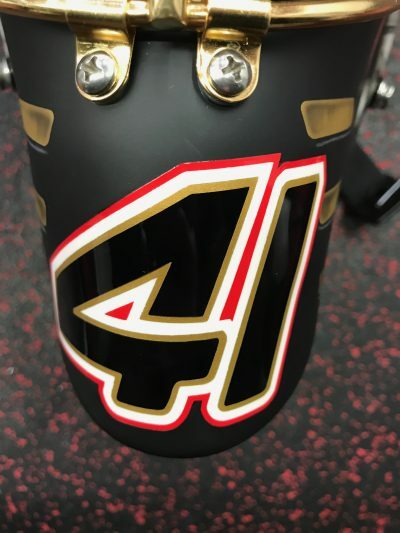 I decided to take the “Jake” (Corvette Racing Mascot) logo off the back plate as well as the Corvette off the side – but I wanted to incorporate the corvette into the new mask, so you can see the corvette flag “eyes” of Jake with the skull as the main part of the mask above my eyes. 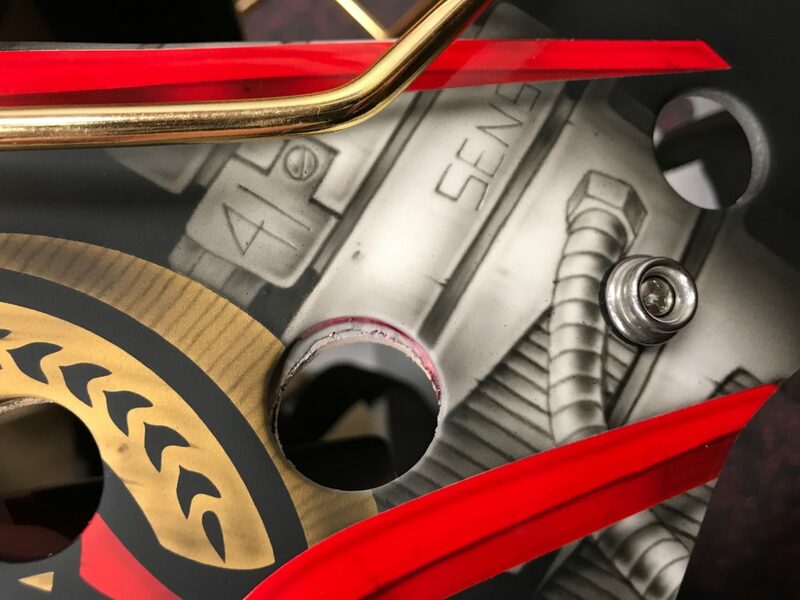 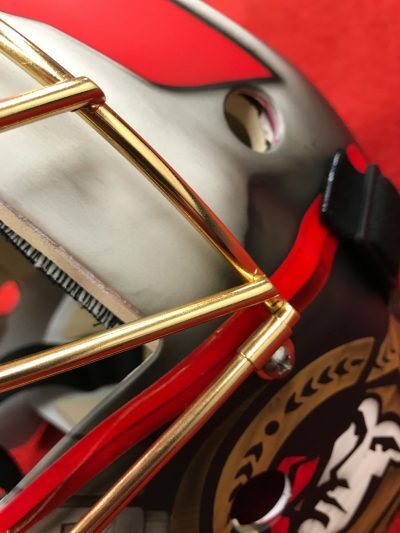 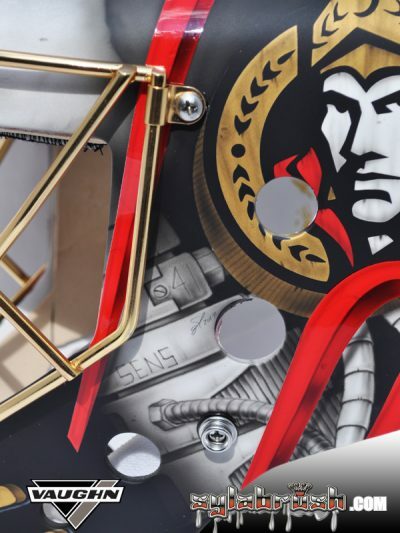 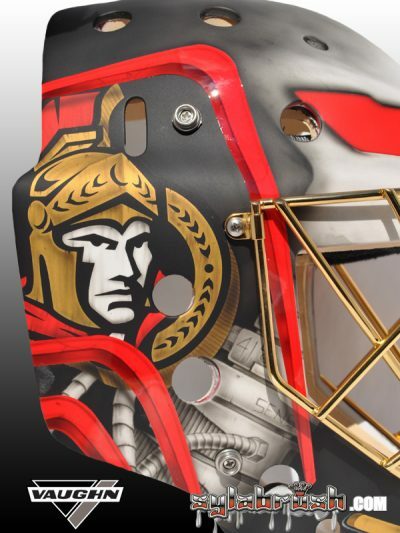 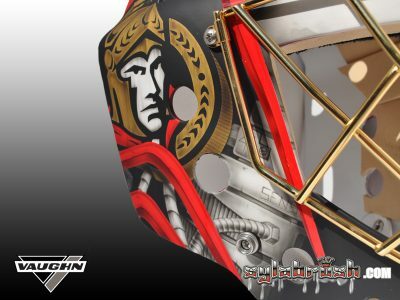 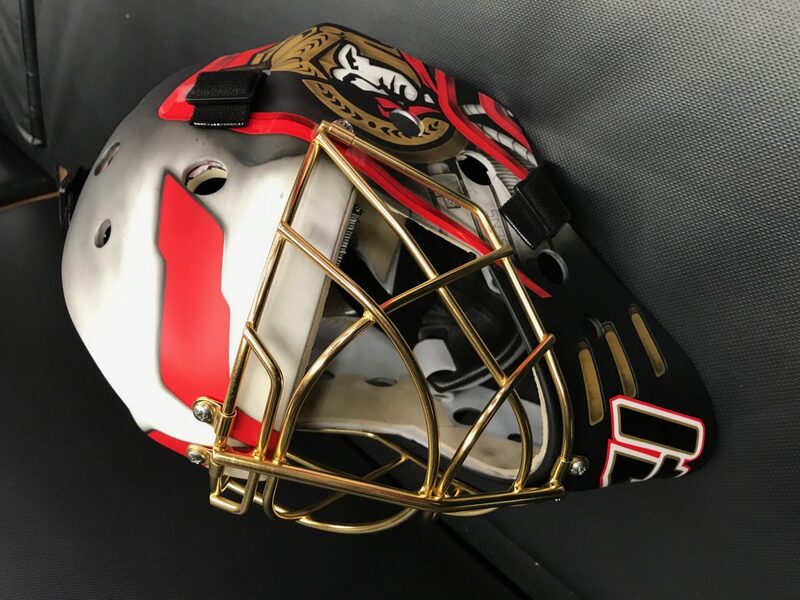 The Sens logos now appear on both sides with a 3d brushed treatment, and there’s a futuristic spine to round out the Jake skull. The pin striping is a continuation from the Brian’s Optik design and ties my equipment package together. 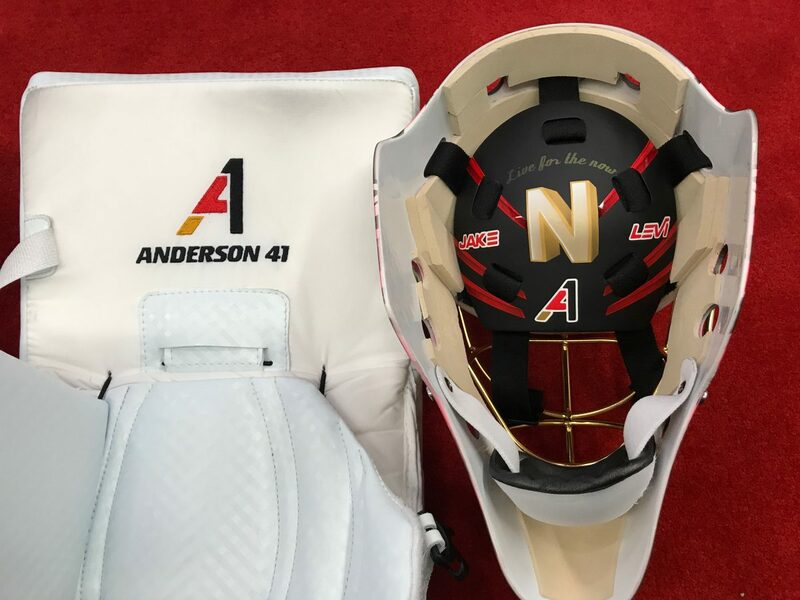 Most goalies put their number on their mask and I have usually had my nickname on the chin, so the number goes there this season. 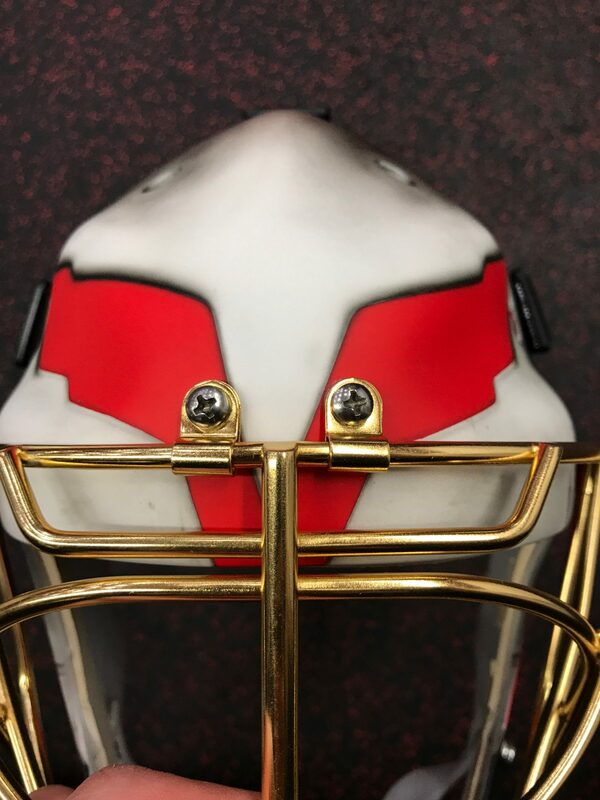 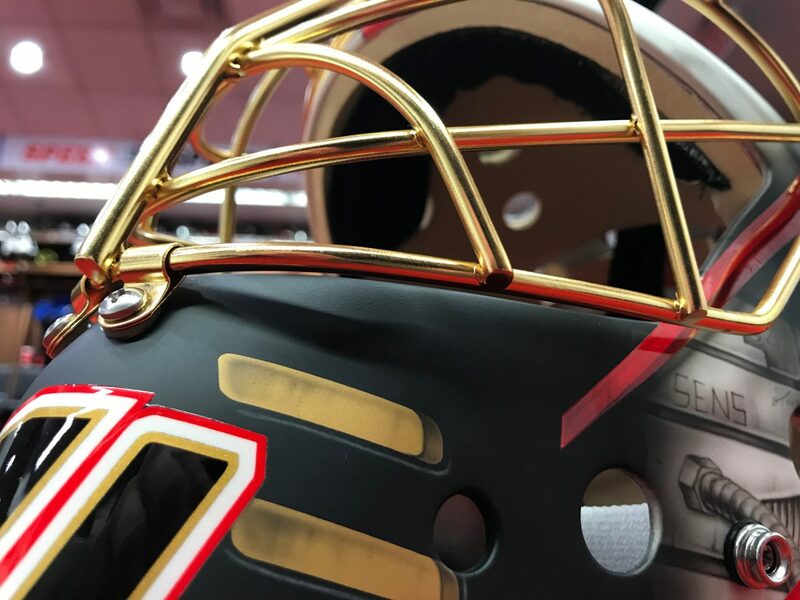 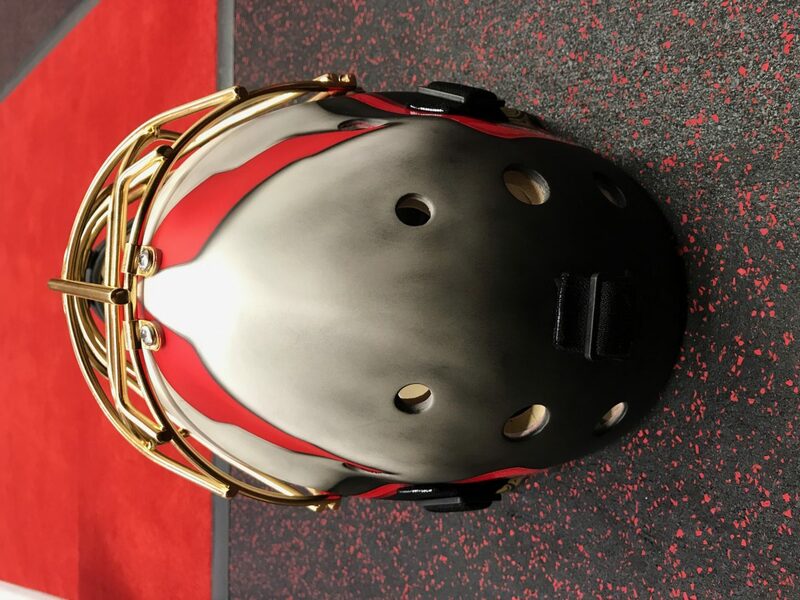 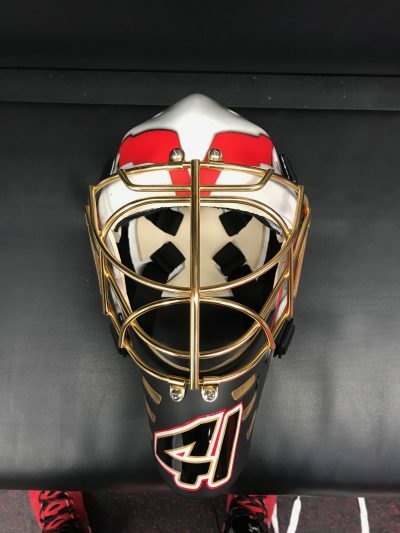 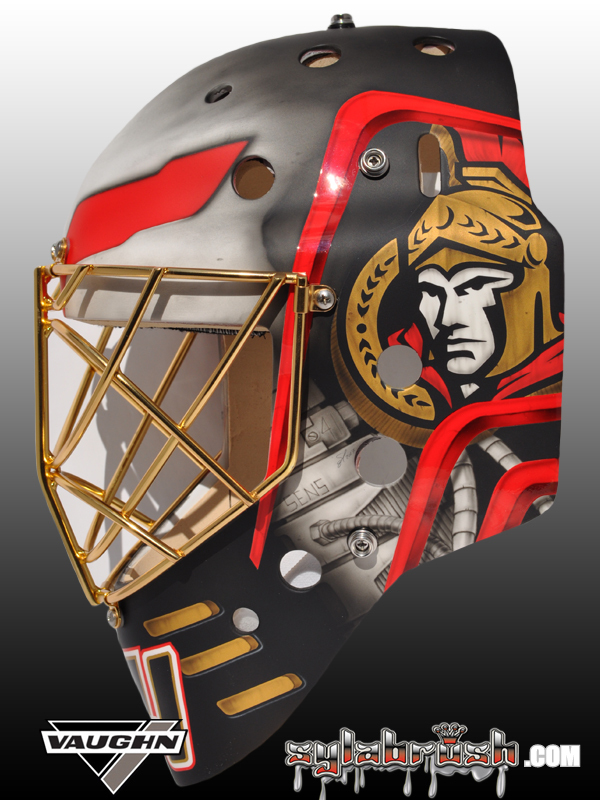 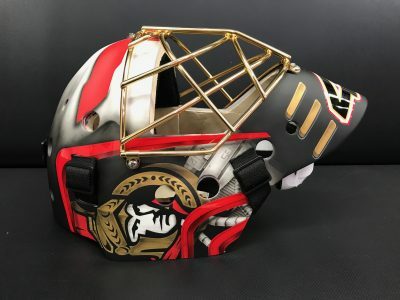 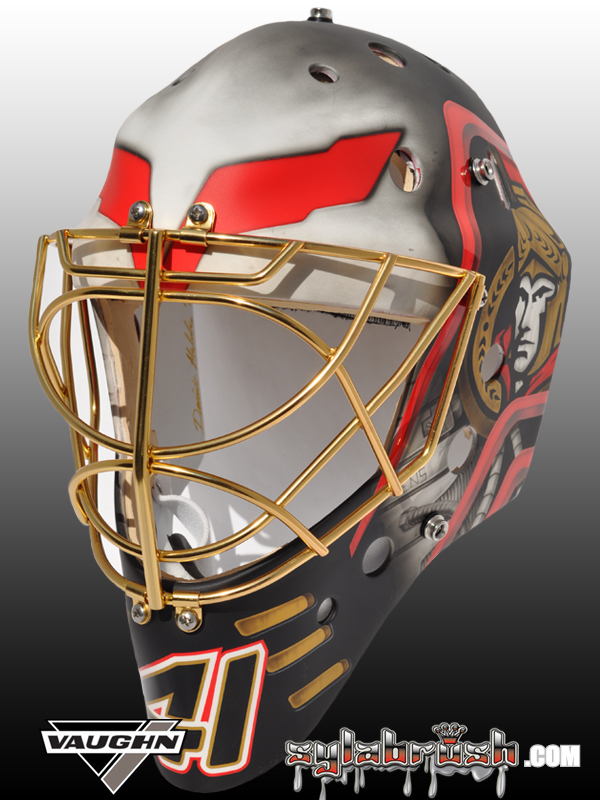 In a real twist, I went with a gold cage for this season, and I think it really brings the mask together. 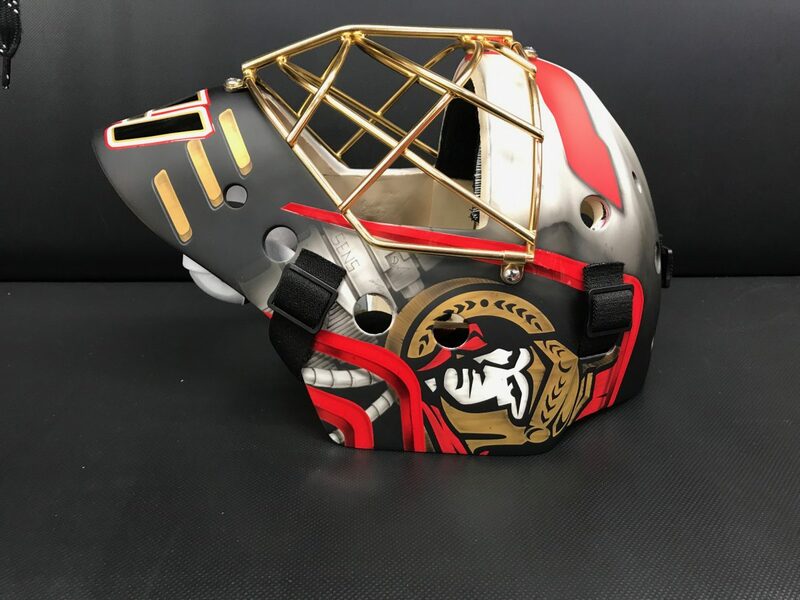 I’ve been looking thru a stainless cage for about a dozen years now and wanted to see a new look. 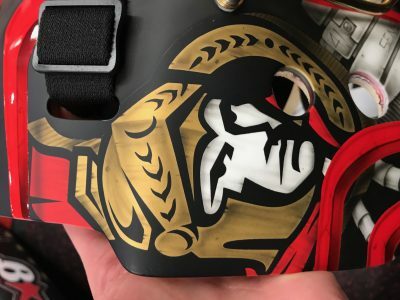 After putting it on, it doesn’t appear to be a huge change from behind the mask, but really sets the mask apart from years past visually. 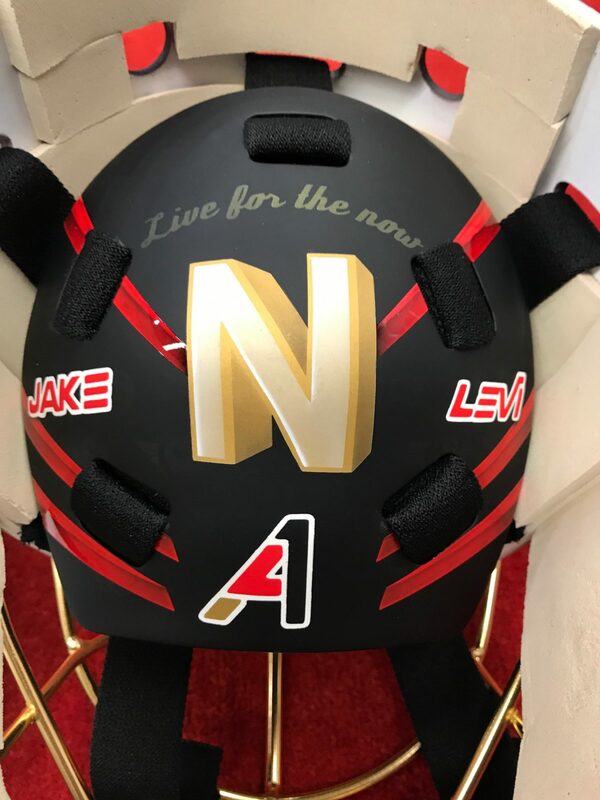 About the backplate: Jake and Levi, clearly are my sons. The N is for Nicholle and a play on words for “and” between Jake ‘n’ Levi. “live for the now” is just a general reminder of last year troubles to always stay in the moment and enjoy the ride. A refreshed Anderson41 logo 41 brandmark makes its debut this year and tops it all off!